Recently, my husband received a great compliment at work: a promotion! While this is wonderful recognition for his hard work, it came with a special “reward”: more travel. He now has to fly to various sites at least once a month. As I told my friend, he’s gone just long enough for it to be a pain but not long enough to get into a good routine. It’s not easy to be the solo parent when I am used to having an extra pair of hands around (or feet on the gas petal!). 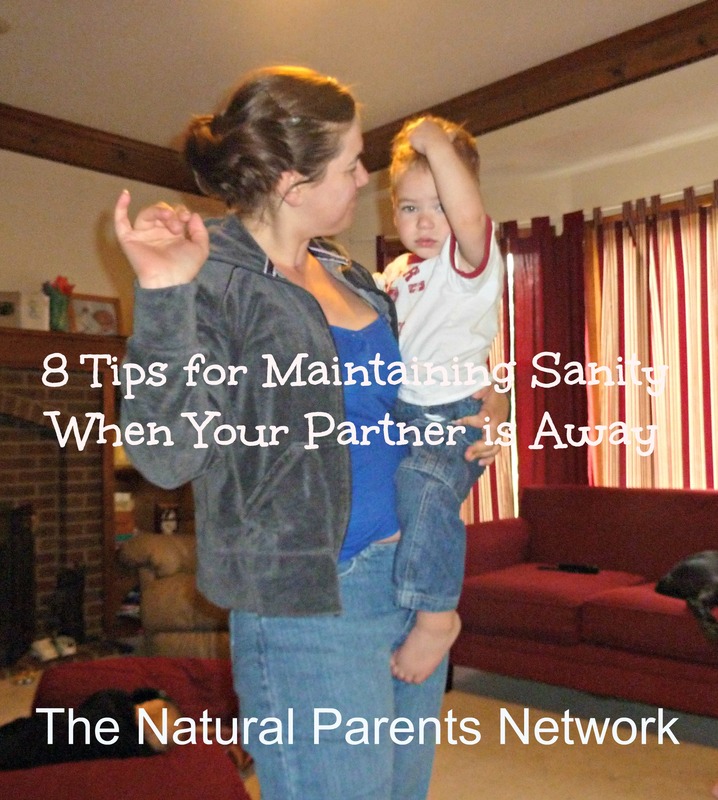 As a result, I’ve come up with eight tips and tricks to maintain my own balance and peace of mind while my husband is gone. 1. Adjust your calendar – If I don’t have to be somewhere, I don’t go. For some people, this can make the days longer and they pack the calendar with events and activities. Either one works; just know your limits. 2. invite friends over – A good friend and I trade off having dinner at each other’s houses when our husbands are out of town. This makes the long evenings go by faster, it gives us some adult conversation, and one of us doesn’t have to cook! Plus, it wears our children out and makes the solo-bedtime-routine easier! 3. Plan something special – Every time my husband leaves town, the kids know they can camp out in the master bedroom. I put the littles in bed with me, the big ones on the floor, and we all watch cartoons until we fall asleep. Maybe you can cook something that you love but your partner hates. What about a special project with the children, like a welcome-home banner? Special activities make the time fly a little faster! 4. Enlist help – Whether it’s a mother’s helper, babysitter, or Grandma coming to stay, another pair of hands can really help out. 5. Try to make the hardest part of the day easy – We all have times of the day when we need that extra pair of hands. In our house, it’s the evening, so when Engineer Husband is away, I need to make the evenings easy. That means that baths are done during the day, and dinner is prepped around lunchtime. When night rolls around, I can focus on homework, putting dinner in the oven, and getting everyone to bed. 6. Let housework go – Without your partner, it can be really hard to get even the most basic chores done. You may prefer to wake up to an empty and clean sink, but if night rolls around and all you want to do is go to bed — leave the dishes. Focus on feeding the children, pets, and yourself and maintaining a reasonable level of cleanliness. It will all be there later, when you have time and energy. 7.Connect – Do you like Facetime, chat, Skype, or a good old phone call? No matter what you use, try to connect with the traveling partner. The kids can say hello or good night and perhaps listen to a story. If you can’t connect over the internet or phone, write letters or notes to be read at a later date. Writing them can be therapeutic, and you won’t forget those important details when you partner arrives home! 8. Be honest with yourself – Even if your partner is only gone a few days, the upheaval in routine can be upsetting. Roll with it, and remember that your focus needs to be your family, not anything else. What tips do you have to make life easier when your partner is away? I love this article! My husband rarely travels with work but it is so hard when he does! It is great just to know that I am not the only one who struggles without Daddy. I also use most of these ideas when he’s gone. really liked this post Laura! My hubby travels a lot and I do so much of what you suggested. One thing we also do is an appreciation and memory notes so that when hubby is back the kids have lots of stuff they can tell dad and they don’t feel worried they will forget 🙂 sharing this! Thanks for sharing your thoughts, and have a great day!